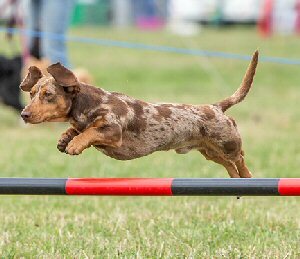 Think of an agility dog – we guarantee no one would think of a Miniature Dachshund! That is until you meet Herbie Sausage – he LOVES agility! Unconventional as he may be as an agility dog, Herbie is out to show the agility world that, no matter what their breed or stature, any dog can have fun doing agility! Haylie Mabe is very proud of her little man. My favourite thing about doing agility with Herbie is how much drive and enthusiasm that little dog has. My second favourite being how he goes out there and proves anyone wrong that has ever given us a funny look when we walk on to the start line or told us he shouldn’t be doing agility. However, once people have watched him run, their opinions often change and that makes me so proud to be out there competing with everyone else – small but mighty. Never underestimate a dachshund! Herbie is my shadow - wherever I go, he goes. The first year of Herbie's life was spent following me around my daily life and getting into mischief on the farm. He spent a lot of time climbing hay bales, but the thought of agility never even crossed my mind! I decided to start training sessions for the Kennel Club Good Citizen Dog Scheme during which time I met Rachel Ward, who has been the most amazing trainer. And that’s where it all started! Being a dachshund, I never thought Herbie would be able to do anything like agility. However, I was very wrong and he showed me just how wrong I was! It's all about finding what motivates them, developing foundations and ensuring correct training practices to keep them fit and strong and preventing unnecessary risks. When we first started training with Rachel, the first few months were spent focusing on all the essential foundation exercises which were invaluable in building up his muscles and fitness as well as from a learning perspective. Herbie has a naturally athletic and flowing technique when it comes to jumping. He uses himself in the most effective way, which limits the stress and strain involved. When training a short-legged or long-backed dog, the use of proprioception exercises and gridwork jumping aids the development of technique as well as building up the correct muscles to aim to prevent injury where possible. During the 18 months we have been training with Rachel, we have worked up to all of the kit slowly and surely to ensure he is confident and, most importantly, as safe as possible! Possibly the most important factor in training Herbie has been the way he which he has been taught to think for himself. Dachshunds are often known for being stubborn and difficult to train. This is not the case. They are often just too clever for us to work them out! Letting them learn to think for themselves by using shaping and brain games, can definitely be the way to motivate a dachshund. They are thinking for themselves and, therefore, think they are doing things all their own way! This was something I was so worried about, having never even been to an agility competition before, never mind actually competing! Luckily for me, I have a wonderful trainer, the most helpful friend and also a fellow newbie, to help guide me through! Herbie is only 227mm tall, so we will only ever compete on lower height, although he can comfortably jump 300mm UKA, so next year should be no problem. Competing with Herbie is really no different to any other dog. He gets out of the van thoroughly excited, zooms round the course, then goes back to bed! Obviously it’s important to warm up and cool down effectively and, for Herbie, keeping warm is a must as he really feels the cold - even when its not actually cold! - so he has a magnetic coat and a variety of different jumpers and coats! 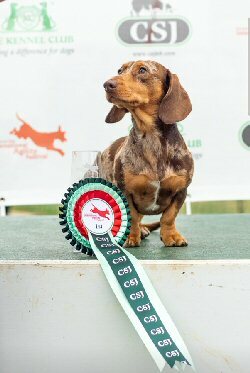 Herbie has just started his KC show journey after a few months of local independent shows, and has just won out of Grade 1 in his first ever stay away show! 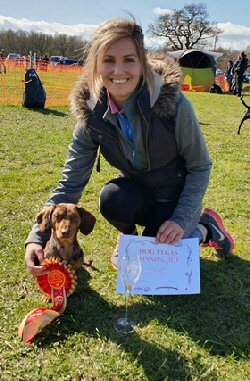 This little dog loves competing and he absolutely tries his heart out for me – I am so excited to see what we can achieve! Do not wrap them in cotton wool. They are a lot more robust than some may think! All dogs are different and no matter what the breed, they can all have limitations. Knowing your dog’s individual limitations and working to improve techniques and fitness as much as possible is key to having a happy and healthy dog. Herbie has regular veterinary and physiotherapy appointments as well as check ups with Kate (Human, Horse & Hound) a McTimoney practitioner to keep his spine and skeletal system aligned and functioning effectively. Hydrotherapy is something which we are due to start in the next few weeks – although I can't see it going down very well with Herbie who absolutely hates water! All of these aspects help us to maintain a healthy, happy dog, who will hopefully continue to love running round an agility course for many years to come! Agility is a whole new venture for us. Looks like this summer will have to be split between competing both the horse and the dog! Haylie Mabe has worked with horses so dogs have always been in the picture. On the farm they have a Labrador and two Jack Russell terriers who are Herbie's best friends! But other than that, agility is a whole new venture for her! She and Herbie have completed the Bronze, Silver and Gold KC Good Citizen Scheme awards. 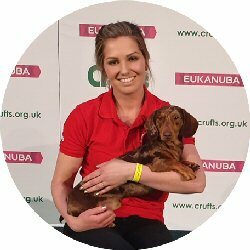 They have been selected for the display teams for Crufts for the past two years and were even in the studio with Clare Balding at one point last year. They will be doing Discover Dogs for the first time later this year! She lives in Shepshed, Leicestershire. I started agility as a bit of fun and keep fit for dogs... and to prove any dog can do it. We train two or three times a week for one and a half hours as well as doing Fit Paws in winter.